A process engineer worked for 7 years at a petroleum refinery. After several years of near-continuous exposure to benzene, hydrofluoric acid, gasoline and other volatile petroleum hydrocarbon vapors, he began experiencing nocturnal headaches, difficulty sleeping, situational stress and anxiety. Initially attributing his symptoms to job stress, he began experiencing extreme fatigue, diminished energy, lack of concentration, body aches, chills, mood swings, confusion, increased somnolence and depression. His physician initially attributed the symptoms to thyroid disease, but this diagnosis was later ruled out. Eventually he transferred to an indoor office in the hope of improvement, but instead, his symptoms grew worse. He began experiencing intermittent jerking movements and involuntary muscle twitches. Eventually he could no longer perform his job duties. An objective brain scan resulted in a diagnosis of occupational exposure-based toxic encephalopathy consistent with exposure to hydrocarbons over a period of years. Eventually the symptoms increased to such an extent that he became completely disabled. Plaintiff subsequently filed a lawsuit against the company who promptly denied any wrongdoing. The company attempted to prove in court that plaintiff's injury could not have been caused by the work environment or by negligence. Dr. Sawyer was retained to determine whether or not the exposures were responsible. He provided compelling, demonstrable weight-of-evidence (WOE) meeting generally accepted causation criteria which demonstrated and isolated the factors which contributed to the plaintiff's condition. the years which put its workers, including the plaintiff, at risk for toxic exposures. He further discovered that proper personal protective equipment (PPE) had generally not been provided. Dr. Sawyer compiled an exhaustive set of industrial hygiene data (all of which had been created by the company itself) which clearly demonstrated a historical pattern of violations and repeated overexposures. Long or intense exposure to solvents approaching or exceeding NIOSH recommended exposure limits (RELs). Relevant symptoms such as increased fatigue, memory impairment, difficulties in concentration and personality changes such as passivity. No other obvious cause of the disease. Effects on the central nervous system persist even after exposure has ceased. Plaintiff worked for years in areas of heavy vapor concentrations (Fluid Catalytic Cracking, Hydroalkylation, etc) at levels near and sometimes in excess of NIOSH recommended exposure limits (RELs). His family frequently noted that he came home smelling like gasoline and other chemicals. Plaintiff experienced significant neurological symptoms beyond work hours, including nocturnal headaches, difficulty sleeping, stress and anxiety, extreme fatigue, diminished energy, lack of concentration, body aches, chills, mood swings, confusion, increased somnolence, depression, intermittent jerking movements and muscular twitching. These symptoms were all reasonably attributable to excessive hydrocarbon exposures. Plaintiff was ultimately diagnosed by a physician with toxic encephalopathy. Symptom onset was consistent with plaintiff's employment history and was consistent with numerous peer-reviewed studies and generally accepted diagnostic criteria (published in referenced studies) and as defined by the World Health Organization and NIOSH. Plaintiff is a lifetime non-smoker with no history of substance abuse. His medical records revealed no reasonable alternative causes. However, substantial evidence existed for over-exposure to neurotoxic hydrocarbons at the refinery over a period of years. The refinery had been cited for numerous violations that placed its workers (including plaintiff) at risk for toxic exposures. Records also showed that the company was significantly under-reporting its leak rates, as well as failing to properly monitor its units for leaks. Although the company claimed that industrial hygiene personnel were monitoring hundreds of workers for toxic exposures, there were only three such individuals in the facility, none of whom were certified industrial hygienists. Only a single urine phenol sample (which was deemed unreliable) was collected from plaintiff during 7 years of exposure in a known hazardous atmosphere. This single sample represented less than 0.057% (1 out of 1,750 days) of his total exposure history. The physician also opined that plaintiff's symptoms became worse at his office job, as he had actually moved closer to sources of vapor and his exposures now occurred in a confined space. Oily water and sewer waste had infiltrated the storm sewer system and waste was being vented into the atmosphere at a rate equal to or exceeding 35 times the permissible exposure limit under OSHA regulations. The company was also aware of the leakage of hazardous chemicals under the plant and had been cited for numerous benzene-related safety violations. The company's inspection record showed numerous instances of non-compliance with benzene emission levels permitted by OSHA, particularly in areas in which the plaintiff worked. There was also considerable evidence in the form of historical documentation that volatile hydrocarbons from various leaks were measured near valves and fittings in excess of 500 to 1000 PPM, far in excess of any legally-permissible vapor levels. Broad Range of Contaminants: Plaintiff was exposed to benzene, toluene, ethylbenzene, xylenes, gasoline, jet fuel and a wide range of aliphatic hydrocarbons consistent with ongoing refinery operations. This set of hydrocarbons has been confirmed in multiple human epidemiological studies to induce toxic encephalopathy among workers chronically exposed to levels near the OSHA PEL. Excessive TPH (Total Petroleum Hydrocarbons): The limited industrial hygiene surveys conducted at the refinery revealed numerous violations of the OSHA PEL for benzene. The industrial hygiene data revealed measurements of benzene and TPH within the refinery at a ratio of 1 part benzene per 97.1 ±15 parts TPH. Applying this ratio to out-of-compliance benzene readings within various refinery units reveals TPH levels in the 97.1 PPM to 46,802 PPM range. TPH mixtures composed of BTEX and aliphatic hydrocarbons have been demonstrated in human epidemiological studies to induce toxic encephalopathy within that range of exposures. To visualize this final point, Dr. Sawyer produced a compelling demonstrative for the judge and jury which characterized air samples taken at the refinery during plaintiff's period of employment. 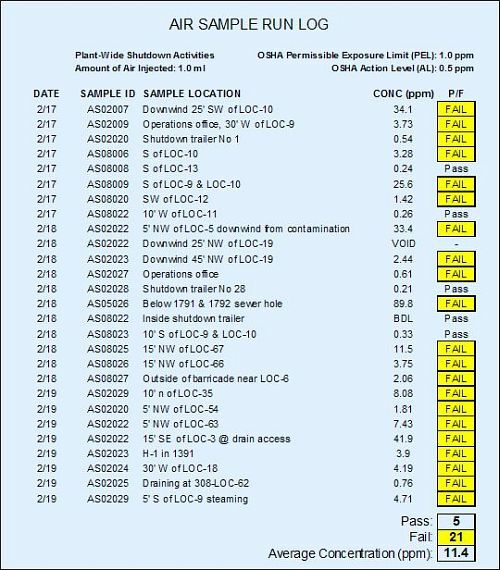 This demonstrative (below) showed that out of 26 air samples collected over a period of several days, 21 of them failed to meet the OSHA standard. This demonstrative showed not only the degree of fugitive vapors present in the environment at the time samples were taken, but also clearly portrayed the scope of violations which characterized the company's inspection record. This damaging piece of evidence clearly demonstrated that the average airborne concentrations of petroleum hydrocarbon vapors were far above the Permissible Exposure Limit (PEL) and that such violations were a frequent and common occurrence at this particular refinery. Dr. Sawyer further demonstrated that the company was out of compliance with NIOSH recommended exposure limits in numerous respects and that such events were consistent over a period of years. Dr. Sawyer provided both forensic evidence and causation weight-of-evidence in light of the available facts and scientific evidence with respect to the induction of toxic encephalopathy. 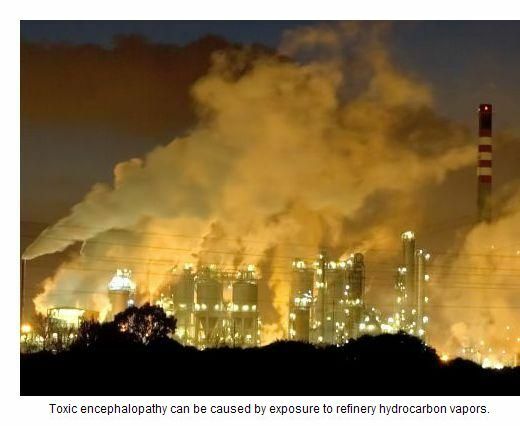 Extrapolation of the benzene air levels to provide total petroleum hydrocarbon air levels revealed that exposures within the range consistent with the induction of toxic encephalopathy occurred, with benzene measured at levels far in excess of the OSHA PEL. Dr. Sawyer was able to demonstrate to reasonable toxicological certainty that plaintiff's exposure, symptoms and history were fully consistent with the diagnosis of toxic encephalopathy resulting from excessive exposures to hydrocarbon leaks, spills and emissions. The judge denied company's attempts to exclude Dr. Sawyer's report and testimony. The company ultimately settled the case ahead of a likely verdict in favor of plaintiff. Dr. William Sawyer is a professional toxicologist with a doctorate in toxicology from Indiana University School of Medicine. He is a diplomate of the American Board of Forensic Medicine and has more than 25 years of extensive experience in public health and forensic toxicology with specialized expertise in causation analyses (for plaintiff and defense) involving alcohol, drugs-of-abuse, pharmaceuticals, herbal products, dioxins, solvents, heavy metals, crude oil, radionuclides/NORM and other substances. Dr. Sawyer has testified at trial and/or deposition in more than 30 states including NY, MA, CT, PA, RI, NH, DE, NJ, WV, VA, NC, SC, GA, FL, AL, MS, LA, AR, MO, KY, IN, IL, WI, MI, OH, MN, MT, WA, CA, TX and OK.
Dr. Sawyer is a distance swimmer for the Gulf Coast Swim Team and recently completed the "Swim Around Key West" race in just over six hours. He is also a triathlete with the distinction of being a four-time Ironman. He loves to fish and SCUBA dive in northern New York State and the Gulf of Mexico.